In St. Louis we are busy celebrating the 250th anniversary of the founding of our town. Many events are taking place throughout the year, not the least of which is the Cakeway to the West. Playing off the slogan of St. Louis being the Gateway to the West, 250 fiberglass cakes are being installed throughout the metropolitan area. Each of them is four feet tall and identical in form, but each is being uniquely decorated by area artists. 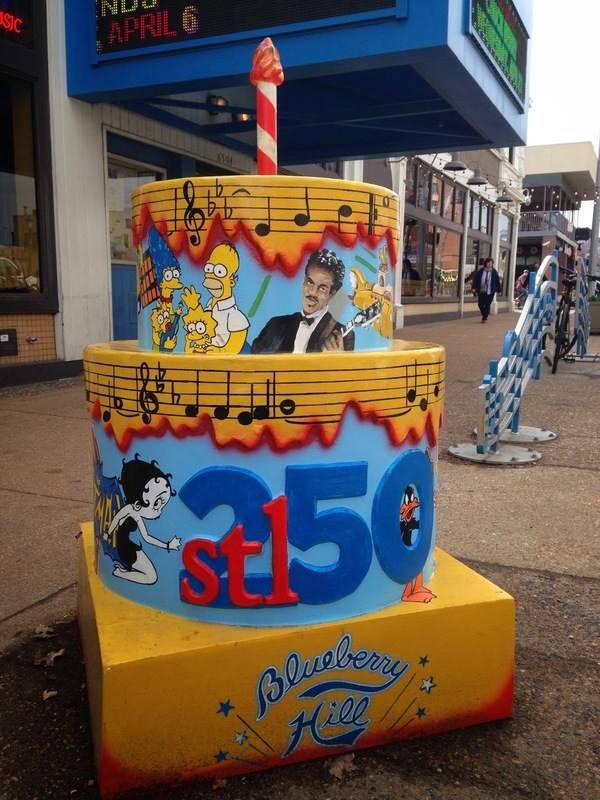 The stl250 organization determined where 200 of the cakes would be located. Landmarks, historic sites, the great outdoors and areas of innovation were selected by the organization. 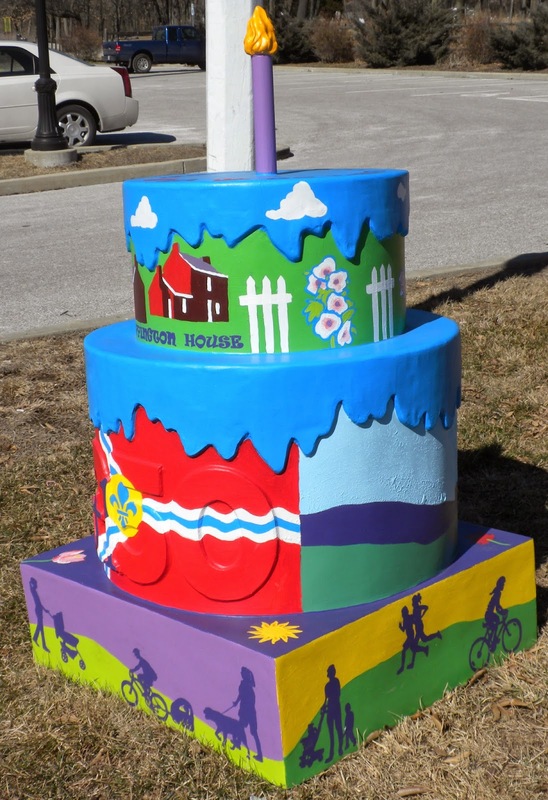 The other 50 cakes would go to local favorites as nominated and voted upon by the public. To date 202 of the cakes have been installed. I know I am not alone in questioning the placement of some of the cakes. If the idea is to celebrate the founding of St. Louis, why is there a cake in Pacific? Or Kimmswick? Or Belleville, IL? In fact, the cakes are so spread out that it is highly unlikely that very many people will ever get to experience all of them. Unlike the butterfly sculptures that were here a few years ago, this sculpture hunt seems too large for most people to attempt. But I am having fun checking to see if any are nearby when I am out and about, so that is something I suppose. They have a phone app you can use, which I have downloaded. I have yet to be successful in using it to find the cake I am looking for, and then checking in to show that I have found it. It is probably me and not the app, however. In the meantime, let them eat cake! Since you all seemed to be sad that I would no longer be sharing squirrel stories, you will be happy to know that Rocky Raccoon has come along to fill the void. Fortunately or unfortunately, Rocky lives outside. It is nice that he hasn't taken up residence in the space recently vacated by the squirrels, but instead he lives under the deck in the back. This drives the dog absolutely crazy! He can smell the raccoon, and so he stands by the steps and barks his fool head off. Because I am so easily disturbed by the non-stop barking of some of the dogs in my neighborhood, I am particularly sensitive to not letting my dog bark for prolonged time periods. But when he is on the hunt for Rocky, Kirby will not obey. The only way to get him in the house is to fake a walk. I go outside with his leash, heading up the sidewalk. He will finally come up to me, and I can snap on the leash and lead him back into the house. I'm not sure how many times he will fall for that one though. When I was sitting in the conservatory in the back of the house last night talking to my daughter on the phone, I saw something drop down onto the deck. Sure enough, there was old Rocky. Up to that point we were not certain if it was a raccoon or a possum under the deck. Now we know for sure. What I don't know for sure is what we are going to do about him. Rocky has checked in, now how do we get Rocky to check out? Squirrel Tales - The End? Last Thursday morning I had the Squirrel Busters come over and permanently close the hole on the front of the house. That morning Wily Squirrel in the back had been partying like it's 1999 in the space above the bathroom. Squirrel Busters determined that the door to the cage in the back had somehow closed, probably due to the storm we had last week. Anyway, he put up a new cage with some fresh bait, and he was confident we would get Wily by the next day. Then, a weird thing happened. I did not hear Wily the rest of the day, or the next. 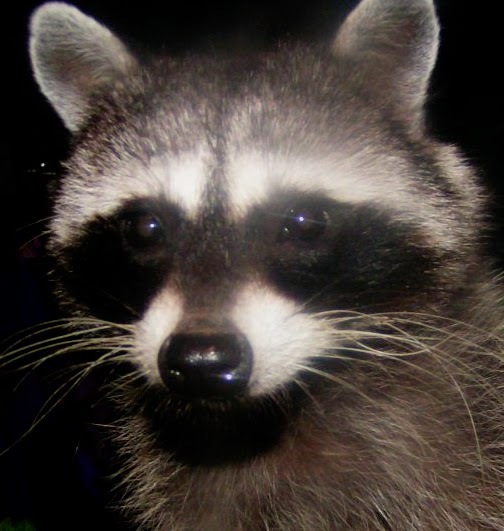 In fact, I didn't hear one scratch, peep, growl or rustling noise from the third floor over the entire weekend. So Tuesday I called Squirrel Busters again, and he came out and closed up the hole in the back of the house. When I asked him why the squirrel would have suddenly taken off like that, he had a theory to offer. It is nesting season for squirrels, and if it was a female she would have been a little freaked out by the fact that her family was no longer living in the space. She may have felt it was no longer safe, and moved to find a new nest. Wily Squirrel lived up to her name after all. Knock on wood, there have been no sounds since the hole was closed so I feel pretty confident that we didn't lock one in. But I will send Jim first into the back room to check! It has been awhile since I discussed the squirrel situation, and I am sad to say that it is not over yet. To date we have captured 8 squirrels. Yes, 8! And remember, they have a bounty on their little heads. 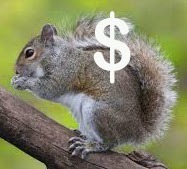 We pay per squirrel that is caught. I told my financial advisor that I may need to take a withdrawal from my 401k to pay the bill. Hopefully that is an exaggeration. I am feeling pretty confident that we have gotten all the family members who were hanging out in the front porch area. It has been really quiet out front. Unfortunately there is still at least one in the storage area of the attic. I can hear him when I get ready in the morning, and it kind of creeps me out. Jim doesn't understand why it bothers me, so I videotaped the sounds to play back for him. I have taken to listening to my iPad while I am in there, and I swear the squirrel is up there practicing his dancing with the stars moves until I turn the music off. And he is a wily one. Most squirrels come straight out of the hole they have made, which is where the trap is placed. This one comes out of the hole, thumbs his nose at me and then scampers off to the left and down the roof. I think Squirrel Busters is going to add a second cage off to the left to see if we can outsmart him. One of the mating seasons takes place in February, so we definitely want every one out before any babies arrive. Hopefully none of the sounds I recorded were baby-making noises!